Located across from MRT Xinbeitou Station is Beitou Park which was built in 1913 and is the center of the entire Beitou hot spring district. 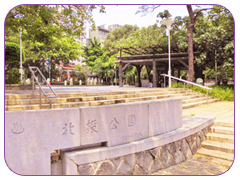 The park was built around Beitou Hot Spring Creek. The song of birds, fragrance of the flowers, the gurgling creek are all sounds of nature that fill the park. Being that the trees in the park have stood for over 100 years, they’re stance and aroma along fill the park. The natural hot spring stream winds through stone bridges and along pedestrian trails that house elaborate wooden gazebos. A place for recreation and relaxation where the air is filled with vapor and sulfur coming from the natural hot springs, really makes it a unique experience. In June of 1913, the Taipei Office of the State used Public Health funds totaling some NT$56,000 to build a public hot spring bath modeled after Japan's Shizuoka Prefecture. With a floor area of about 700 ping, it is a two-storey brick building built in a British style, and became the largest public spa in the area. Due to the many changes in management after the war, it eventually was abandoned. On October 31, 1998 after undergoing extensive renovations by the Taipei City Government through the enthusiasm and support of local residents, the “Beitou Hot Springs Museum" officially re-opened for use. Hours of Operation：Tuesday to Sunday 09:00-17:00. Closed on Mondays. April 2012, the U.S. entertainment news website Flavorwire.com arts awarded the Beitou branch of the Taipei Public Library as one of the 25 of the world's most beautiful Public Libraries. The Taipei Public Library, Beitou Branch, is Taiwan's first truly green building. 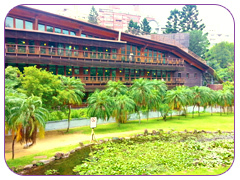 It is located in the forest surrounded by the rich ecological environment of Beitou Park, and Beitou Hot Springs Museum. The basement, ground floor, and second floor make up an area of over 650 pings. Enjoy the "ecological", "saving", "waste reduction", and "vigor" of this famous “green” building. 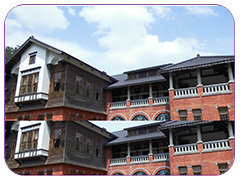 This Japanese-style wooden frame building is located in Beitou Park and built in the late 1930s. The building area consists of about 250 square meters, with a total living floorspace of 335 square meters. The building conforms to the natural landscape. The upper floor uses Japanese-style wooden structure framing and has large wooden floor to ceiling windows, resulting in a simple and elegant style; while the lower rooms provided shelter from the heat, and so is a reinforced concrete structure. The building enjoyed war era luxury construction methods. Plum Garden was also the summer home for Calligraphy Master Yu You-Ren. 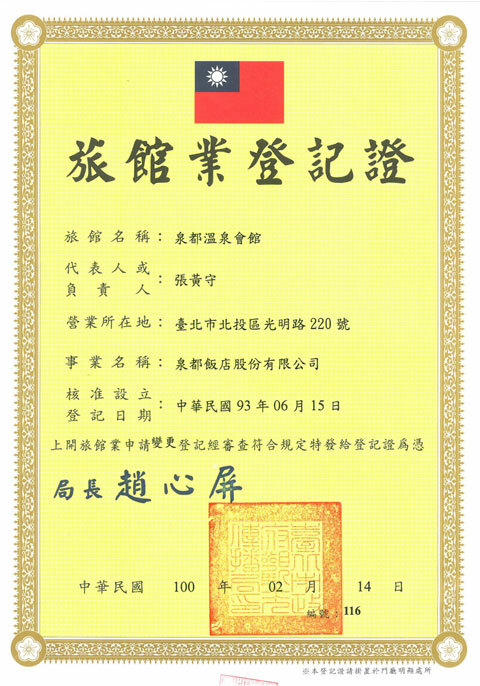 The Master inscribed the Chinese characters for Plum Garden "Mei Ting" on the door post of the house. The house has a spring pool, broad patio, towering old trees, and scenic greenery. Yu You-Ren’s masterpieces are being exhibited here. 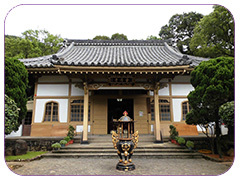 This is the only Japanese Shingon Buddhist temple in Taiwan. It was built in 1905, and is in a style typical to that of Japanese ancient architecture. Because railroad workers built the temple, it is also known as "True Iron Temple.” It is currently one of the city’s historical sites. The temple enshrines the god "Guanyin Tang Shou", who is regarded as the patron saint of the Hot Springs, and has long been a religious center for local residents. 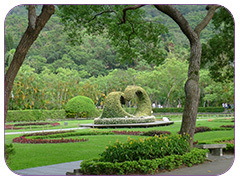 Yangmingshan National Park is located at the northern margin of the Taipei Basin. From the Park’s Easter side stands Huangzuei Mountain and 5-Fingers Mountains. On the west lies the Tianshan Mountains; to the north stands Bamboo Mountain and Earth God Ridge. 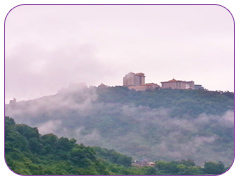 The south side borders Shamao Mountain, all in all the area includes about 11,338 hectares. Yangmingshan National Park due to the effects of latitude and altitude, has a subtropical climate with warm temperate climate zones, and four distinct seasons. From February to March it is spring cherry blossom season in Yangmingshan National Park, at which time, a variety of colorful azaleas and cherry blossoms fill the hills, sweeping away the winter monotony. In the summer, the southwest monsoons blow in resulting in occasional afternoon thunderstorms. After the fog and rain clear, the mountains are often seen straddling Hongqiao valley. When autumn comes in October, silver grass grow plenty, swaying in the wind. The red dotted branches, leaves turning patches of golden turn the famous "Dadun Autumn." Due to the winter northeast monsoon, Yangmingshan area is often cold and rain, with low humidity, clouds fill the air, allowing for some unique scenery; cases of intense cold weather. Calla Lilly Ecological Area at Bamboo Lake. The Calla Lilly “season” is hosted annually by the Taipei City Government, Department of Economic Development to show case the rich crop of calla lilies at Bamboo Lake from the end of March to the end of April. The flower festival showcases the different colors of flowering blooms, but especially that of the large calla lilies that bloom near Bamboo Lake. Bamboo Lake is located in the mountains of Yangmingshan at an altitude of about 600 meters where the climate is cool making it the perfect environment for the growth of high altitude vegetables and flowers. Therefore all kinds of plants and flowers dot the landscape with the calla lily fields being the most famous and popular for tourists to visit. Calla lilies flower from December to the following May of each year. 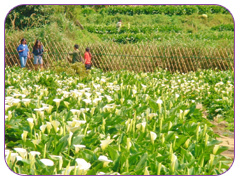 The flowers grow in 13 hectare area and harvesting of the flowers is most common in the months of March to May.In addition to the well-known pure white calla lilies, local farmers have developed yellow, purple and other colors of calla lilies. 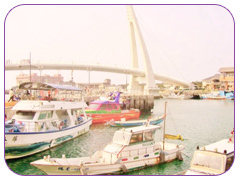 Danshui is a town full of cultural relics. The old street is famous for its pastries. Visit the Red Castle, Truth Church, Tamkang High School (The filming locations where Jay Chow's movies name" secretly "), Tamkang University ... and so on. Stroll along the river, watch a sunset, take a walk on Fisherman's Wharf, cross over Lover’s Bridge, or catch a ferry to the other side of Bali where you can grab a cup of coffee and enjoy the sea. When walking along the pier be sure to try some of the local treats like the well-known snack a-gui, fish cakes, fish balls, iron egg, sour plum juice ... and so on. 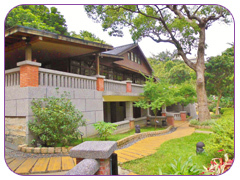 The Shilin Official Residence building was originally used for horticultural management (formerly Scholastic gardening experiment branch). When the Nationalist government moved to Taiwan in 1950, it became the first official residence of President Chiang Kai-shek and was closed to the public. After 46 years of tight guard, and due to the tide of democracy, the Shilin Official Residence was officially opened in 1996, becoming another place for tourists to enjoy during the holidays. The residence includes an outside garden, the inside garden, the main house. The outside garden greenhouse potting area (mainly for orchids), is next to Rose Park (mainly roses). The rose garden is in full bloom from March to May, and was a favorite of Madame Chiang. Flowers bloom everywhere inside the residence, surrounded by a quiet and serene landscape. Hundreds of imported roses bloom all year round. The residence is free and open for public visits. 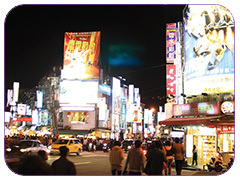 Shilin Night Market is the largest night market in Taipei that most tourists will come to visit. The very broad area of the night market can be divided two main areas. One is the traditional Yangming streets surrounding the theater, including the Grand Palace area of South Road; the other is the newly rezoned 101 JiHe Road. Guests go to the night markets in Taiwan to enjoy authentic, affordable, street cuisine such as, oyster omelets, squid soup, tempura, pie tortillas, fried chicken, fried buns, Chinese sausage ... and hundreds of snacks. Also this is the place to enjoy a cheap shopping experience and Taiwanese-style massage. 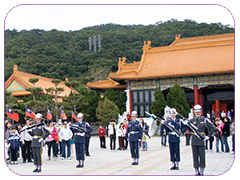 The National Palace Museum is one of the world's four major museums. Formerly established at the Forbidden City in Beijing in 1925 but in 1948 due to the civil war, the Nationalist government arranged for the Palace Museum artifacts to be shipped to Taiwan. The present Museum was completed in 1965 and renamed Zhongshan Museum, more commonly known as "Taipei Palace Museum". Five shipments of relics from the Forbidden City were originally planned from the Chinese mainland, but due to war there were only three shipment made. In the end a total of about 2972 boxes made it to Taiwan. This was indeed a precious and rich heritage that allowed the National Palace Museum to become world famous. The museum’s collection of ancient Chinese antiquities include history, literature, and a total of more than 650,000 paintings, also other famous artifacts such as the "Jadeite Cabbage." The Museum’s gift shop is definitely worth a browse. Taipei Martyrs Shrine is located near Beian Road and Mingshui Road. 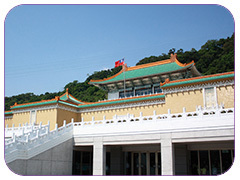 The construction of the main building is in imitation of Beijing’s Forbidden City, Hall of Supreme Harmony with the outside wall being having a purplish-red coloring. Inside the temple, a memorial tablet is dedicated to the martyrs who have sacrificed their lives over the years. A must see for visitors is the changing of the guards ceremony. Weekends and holidays are busy with a lot of travel and pilgrimage tours. Open daily from 09:00- 16:40 pm with an hourly changing of the guards ceremony.